Thank you and that was very moving. I too am tired of seeing my flag dipped in blood of other nations to secure the wealth that now accumulates at the top 1% of the world. I am an American and I feel that we have been infiltrated with liars and deceivers that claim to have nationality in our Nation. Many times we see those leaders on the side of our President, aiming our missiles at poorer nations. Missiles that consist of harsh work conditions that contaminate their soils, water, air, and sovereignty. I wish to also convey that there is a large group of us, trying to show the true side of our relationship with a nation that wages wars upon a people because of religion. And they wage them in the name of Liberty for all, while dipping our flag in blood, as they bomb a nation that is a third world country in comparison. That small country fights with all they have and for decades have been prone to the genocide of our financial support. We need to cut ties to banks and world leaders and destroy the military complex that we have. We should also be willing to spread a message of help by sending seeds and material so they can use them to cultivate their lands for profit for their Nation. It is sad to know that as these days as we see them we are just as pawn to the leaders and special interests. With the coming news of war that that one nation wants we will only see the demise on our own soil. I hope that our leaders see the truth in not backing a nation that uses our people to wage their wars, because that Nation has far more support than that of theirs or ours. While I don’t share your assumption that the movement just wants “their piece of the pie”, I do acknowledge that many may be innit for themselves. That’s true of any movement, including Tribal Government as operated by the Militia Occupying our lands. In an era where Sovereignty by Treaty Rights should hold that we could rescind our citizenship and choose our citizenship, rather than to be compelled by Quantum. 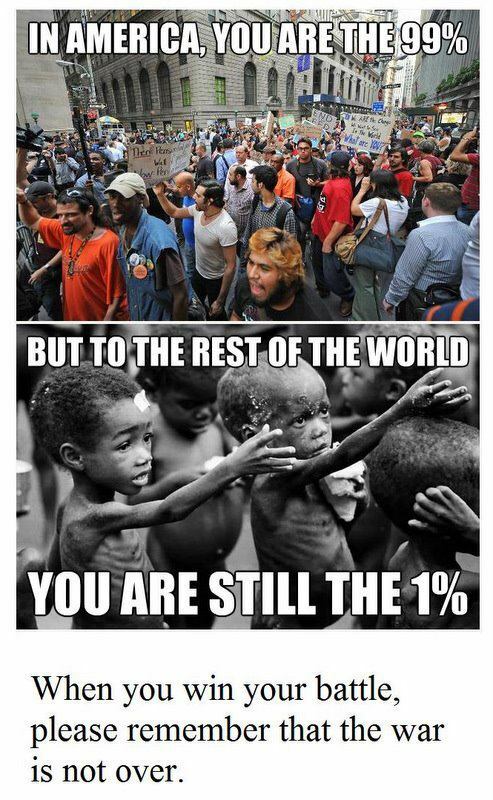 If I were to protest the 99% I’d start by saying I’m not %50 percent of anything. Or a 1/4 of anything. I appreciate another strong Native voice actively speaking out to the Occupation. Thank you for pointing out the affinity process, which by far, we can more apply in the General Assembly’s. However, presence, and speaking out, forming committees and applying these statements at each General Assembly is the most profound statement. That the Occupation is willing, through the General Assembly structure, to facilitate such a process. And that no such process can exist if people on the ground don’t speak up and add it in. Furthermore, I remind us all that it is the work of Native Activists to make this happen, because no one can do it for us. The feet on the earth, is our stand. Thank you for posting this very important message. Thank you for this article as it was most informative. World wide people are going against the forces of injustice, theft of lands and resources and oppression. This is a good time and we must always be positive and pray for world wide peace in the middle of this chaos. This is the only way we can survive into the new world order, we must maintain non violence.